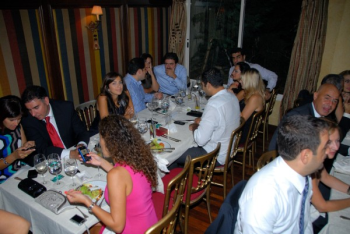 On Wednesday July 14, 2010, the Alumni Relations Office organized its annual dinner at Le Particulier Restaurant in Beirut. The event was attended by over 250 alumni, Board Members and friends. The Alumni Relations Office presented two alumni awards, the Alumni Recognition Award & the Alumni Achievement Award. The Alumni Recognition Award was granted to an exceptional alumni figure for her outstanding contribution and support to the Community and to LAU namely Mrs. Emily Abi Rashed Nasrallah’56 Novelist, teacher and women’s rights activist. The Alumni Achievement Award was granted to yet another exceptional alumni figure for his significant accomplishments in his professional life, namely H.E.Dr. Selim El Sayegh ‘83, Lebanese Minister of Social Affairs.